The Results Are In! The Kids Win! 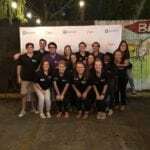 Last week, Dance Marathon at LSU competed against University of Alabama’s Dance Marathon, UADM, in a head-to-head competition to see which program could raise the most money for their local Children’s Miracle Network Hospital. 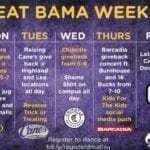 Both programs planned week-long events to encourage students, faculty, and members of the community to get involved. Saturday at 2 pm, the two programs announced that the Tigers had won by fundraising over $38,000 in a week, but everyone knows the true winners are the kids! Congrats to Dance Marathon at LSU and UADM! 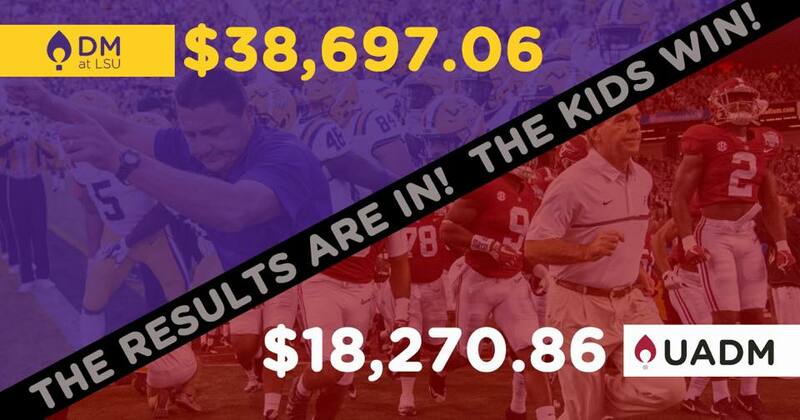 How did Dance Marathon at LSU raise over $38,000 in one week you ask? They did it by sharing their passion and extending an invitation to the community to get involved and “Beat Bama”! Dance Marathon at LSU student leaders planned both a fundraising and social media strategy for the week. 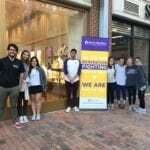 Their fundraising strategy included “canning” events, or asking for donations outside of popular grocery stores such as Walmart Neighborhood Market and Calandro’s Supermarket, coordinating Give Back Nights at Kendra Scott, Raising Cane’s, Chipotle, and Barcadia, and hosting a benefit concert featuring the bands Burnhouse and 16 Bucks. Dance Marathon at LSU also had a strong presence on social media by asking dancers to fundraise online through DonorDrive. 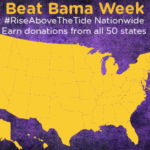 Dancers were challenged to get donations from all 50 states (which they did!!) on #NationwideWednesday and also post a photo of themselves as a kid on #ThrowbackThursday to connect back to the kids being treated at Our Lady of the Lake Children’s Hospital. We are so blessed to have passionate supporters like Dance Marathon at LSU at Our Lady of the Lake Children’s Hospital! If you would like more information on Dance Marathon at LSU, please visit lsu.edu/dancemarathon. To help make miracles at Our Lady of the Lake Children’s Hospital, please visit ololchildrens.org. 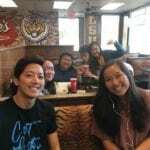 Previous post: Extra Life Locally Raises Over $7,000 For The Kids!